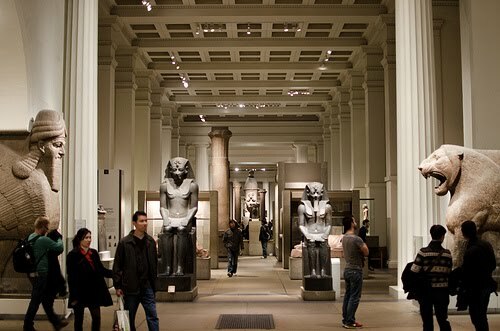 Often Londoners roll out of work on a Friday and go to the pub, which can be a lot of fun, but if you're in the mood for something a little more cultural after work on a Friday, selected galleries and the Great Court of the British Museum are open until 8.20pm. There are also regular lectures and events, with tonight's considering the magnetism of Mecca, and exploring Hajj as artistic inspiration with British artists Idris Khan and Peter Sanders, and Saudi Arabian artist Ahmed Mater. However, if you're in the mood for something a little less highbrow, there is also an excellent cafe/ bar and restaurant. Just stumbled across your blog. I'm surprised to see how regular your posts are despite the last of comments. I wish you could take a lot more photographs of your experiences. I love visiting museums after hours and the British museum has the added appeal of its stunning central court which after dark looks simply stunning. I am not soooo interested in Anglo Saxon art or Roman archaeology. However I am fascinated by the idea of exploring Hajj as artistic inspiration i.e not just peoples' experience of Mecca, but the artistic inspirations they took home with them. We have good lecture series here in Melbourne (and in Canberra and Sydney) but there is nothing like living near the centre - London!